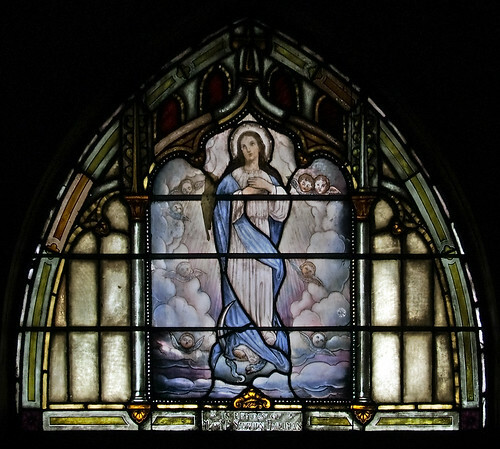 HERE ARE PHOTOS of Immaculate Conception Church, in Saint Mary's, Missouri. 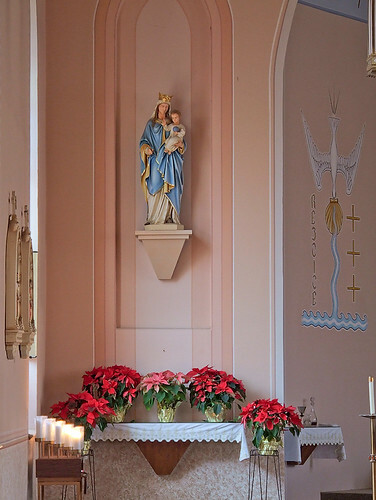 Located about 73 highway miles south of downtown Saint Louis, the church is in Sainte Genevieve County. On October 13, 1853, St. Mary's Seminary bought six acres of ground from Miles Gilbert for one hundred dollars. A great deal of wisdom and foresight went into securing this most desirable site. A small frame church was built in 1855. On September 29, 1874, St. Mary's Seminary deeded this land, which was used for parish purposed to Archbishop Peter Richard Kenrick. 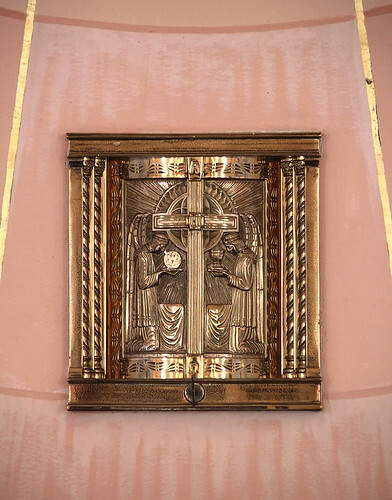 Since 1871, dioceasan priests have been assigned there, and gradually Immaculate Conception parish changed from mission status to an independent parish. At this time, there were about one hundred seventy-five parishioners. The parochial school was laid September 11, 1887 by Monsignor P.P. Brady. The beautiful brick structure was erected while Rev. E.J. Wynne was pastor. He was pastor from 1887-1893. The parish church served the Catholics in St. Mary and the people living on surrounding farms. Later Mr. John Tlapek, with other interested members of the parish, arranged for the beautiful terraced hillside. Steps were made down the hill, which consist of nine sets of steps with nine steps in each group. The cross on top of the steeple was donated in 1913 by Mr. and Mrs. Charles R. Bartels. 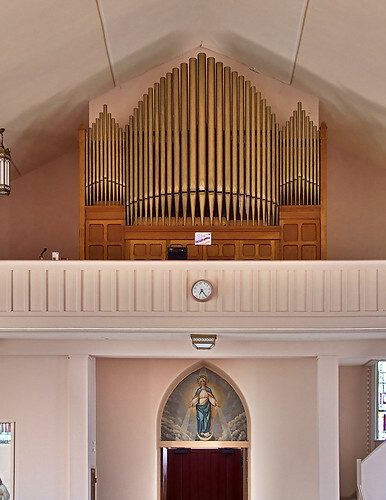 The pipe organ was donated in 1924 by John Tlapek and Walter L. Schaaf. The town itself is variously called Saint Mary, Saint Mary's or Saint Marys. The last grammatically and logically offensive variant spelling 'Marys' is due to a decision by the U.S. Board of Geographical Names to get rid of possessives in all U.S. place names, according to the nominalistic theory that place-names are merely arbitrary denotational units. However, the town is not named after several Saints named Mary, but instead after the Blessed Virgin Mary. The keystone in the arch is inscribed 1889. A view of the stained glass window above the door. 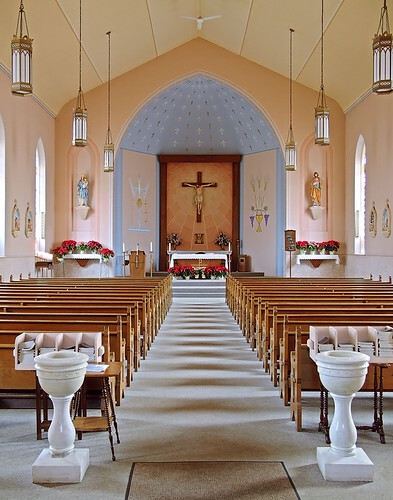 According to the 2007 parish census, this parish has about 338 Catholics. The church, located on a bluff about fifty feet higher than the area below, has a nice view into the state of Illinois. The town was originally named Saint Mary's Landing, but the small watercourse at the bottom of the photo above is probably only large enough for a canoe, making the 'Landing' name seemingly inappropriate. About 900 feet distant from the church, that watercourse is called the "Old River Channel", and indeed was once the main channel of the Mississippi River. Roughly the center of this channel, and not the Mississippi, marks the boundary between Missouri and Illinois, although federal topographic maps call that boundary 'indefinite'. There are several of these 'avulsions' along the Missouri-Illinois border that break the Mississippi-as-boundary rule. In the far distance in the photo, you can see the Illinois bluffs, six miles distant, which demarcate the other side of the Mississippi Valley. 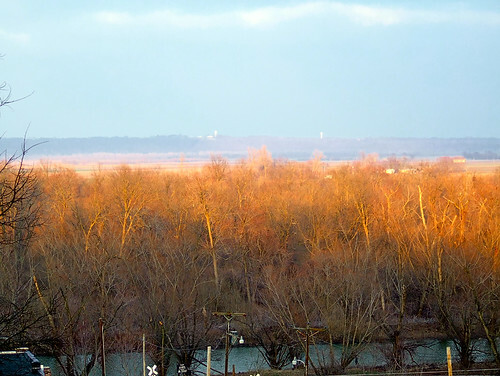 The area on the other side of the Old River Channel, nicely lit by the setting sun, is Kaskaskia Island. Once a part of the Illinois mainland, a flood in 1881 dramatically altered the course of the Mississippi River, destroying the old town (and former Illinois State Capital) of Kaskaskia. 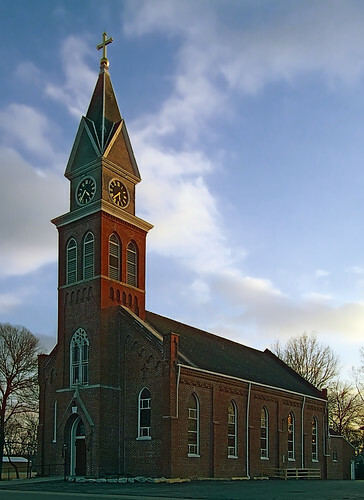 The new town of Kaskaskia, located less than four miles northeast of Saint Mary's, is home to another Immaculate Conception Church: this parish and mission to the Kaskaskia Indians, founded by Jesuits in the 17th century, settled there in 1703. The 1843 French-style church was moved — bricks and timbers — about two miles south to its current location in 1894. An aerial photo of the region shows clearly the former channel of the Mississippi River. 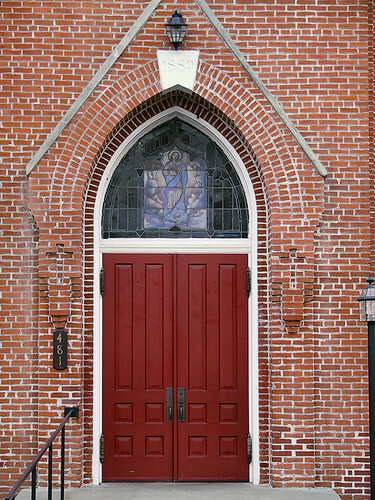 Click here for a church location map.